Wim van den Brink received the 2017 EUFAS-EAR Award for outstanding contributions to the advancement of addiction science. The award was presented at the European Psychiatric Association’s (EPA) 26th annual meeting in Nice in March 2018. Professor van den Brink gave the award address lecture at this occasion. Professor Wim van den Brink (third from the left) received the 2017 EUFAS-EAR award. Van den Brink is professor of Psychiatry and Addiction at the Academic Medical Center, University of Amsterdam. He is also Director of the Amsterdam Institute for Addiction Research. 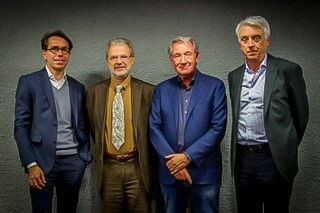 The picture shows (from left to right); Professor Falk Kiefer, Editor in Chief of European Addiction Research (EAR), Professor and former President of EUFAS Anthony Gual, Professor Wim van den Brink and founding president of EUFAS Professor Karl Mann.